While you may have already read introductions from the Make San Antonio team, you have yet to meet our newest addition. 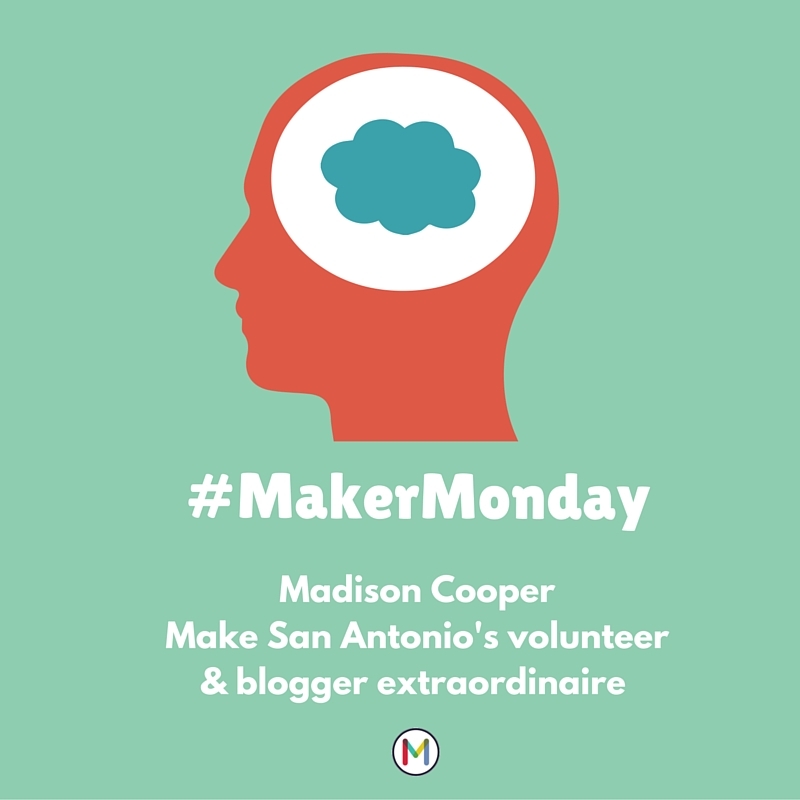 Madison Cooper is Make San Antonio’s first volunteer. Madison found Make San Antonio through our profile on SA2020, she was “looking to be apart of a meaningful organization” and stumbled upon us. We’re happy to have her join the team, and glad she’s shared a bit about herself with our readers. Make San Antonio: Tell us a little bit about yourself. Madison: I have always had this passion; an inexplicable drive to create. The one thing I have found in the creative field that fulfills me the most is writing. Along with being the new volunteer (which entails writing blog entries) for Make San Antonio, I am working on a screenplay, short stories, poems and am a full-time student. Who or what inspires you to be a maker? Pinterest, the idea that all aspects of creativity are all in one place is like heaven for me. I frequent the quotes and book boards often for inspiration on new books. My favorite authors (F. Scott Fitzgerald, George Orwell) are major inspirations for my writing. I also believe that nature awakens the creative side in anyone. My family and I went on road trips across America every summer growing up and we saw places like Yosemite, Grand Teton, and Yellowstone. Memories from those places really help spark new ideas. What are your favorite things to make? I love watercolors; the flowing impression it leaves on the art has always been fascinating to me. Natural body care is also really enjoyable for me to make. I think it is really amazing how you can use simple ingredients that you have lying around the house and make an alternative to something you use everyday, like lip balm or a body scrub. What is your tool of choice when making? My hands! I get frustrated sometimes when a do-it-yourself project takes 20 tools just to make one thing. I prefer a craft that I can make simply, although, a glue gun is a necessity for some of the crazy projects I come up with sometimes. How can people take more of a do-it-yourself approach in their craft endeavors? I think that experimenting with what you have is the main thing. I often see something online like a trendy journal and look at it closely to find that I have everything they used to make it. It takes a bit of thinking outside the box and following your gut feeling, but sometimes it leads to amazing ideas you may have never thought of before!